The original iMac Mount Adapter Kit provides a simple and secure way to attach your iMac to any VESA compliant mounting device. With our patented design, we have been helping customers properly mount their iMac models having a non-detachable stand since 2007. Installation is quick and simple with no alterations made to the iMac. We also care about preserving the iMac's finish, providing foam pads and plastic caps to prevent scratching of the stand. Quality: Parts are manufactured from high-grade aluminum. The correct VESA compliant tapped holes are provided for attachment. The anti-rotation pegs are steel, not plastic. Durability: With a 1/4" thick aluminum plate similar to the stand on the iMac, and a clamping device milled from 3 1/2" aluminum round stock, you can be sure the iMac Mount Adapter will properly secure and hold. Value: The iMac Mount Adapter is universal. Kits purchased since 2007 to mount 20 inch iMac models have been reusable to attach newer iMac 20 or 21.5 inch models, including the new 4K Retina. The IMAD021527 adapter kit we began offering in 2013 for larger models will correctly support all current 27 inch models, including the 5K Retina, as well as all previous 27 and 24 inch iMac models. The iMac Mount VESA Adapter Kit provides a method for attaching the iMac to VESA compliant mounting devices by providing a mount interface solution while the stand remains on the iMac. 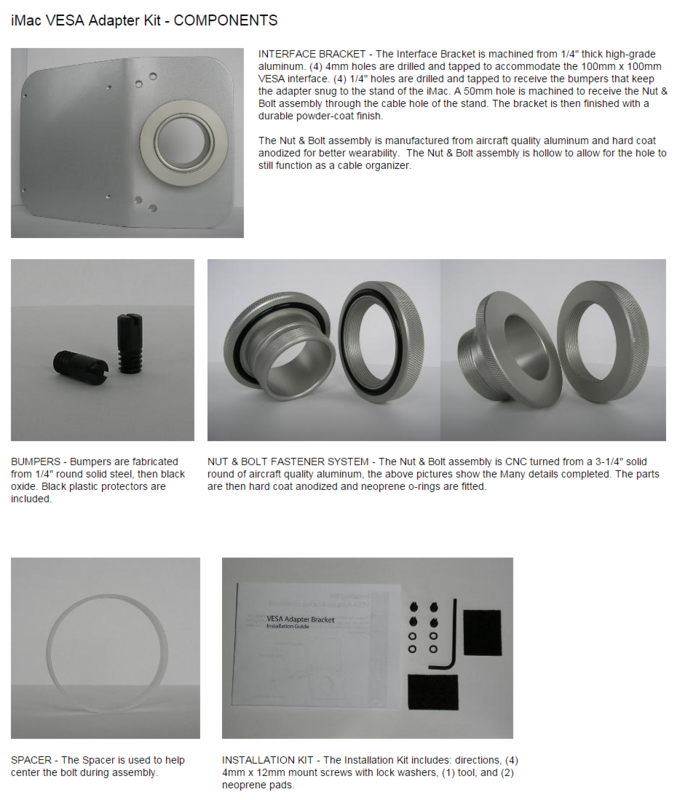 We offer a universal mount adapter kit for all 21.5 and 20 inch iMac models, and a universal kit for all 27 and 24 inch iMac models. This includes the new 21.5 and 27 (slim) models, 4K and 5K Retina models. 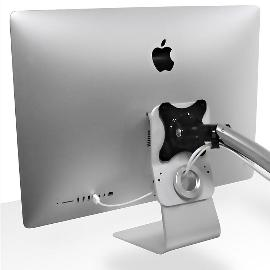 Our patented design integrates with the iMac stand using a unique fastening system, eliminating the need to remove the stand or modify the iMac in any way. This allows for the iMac to remain as a portable computer and ensure warranty is not voided due to disassembling or modifications made. When mounted, the fastening system allows for the iMac to be dismounted quickly and easily for relocation or travel. Note that VESA mount devices used for mounting iMac computers are required to have the 100mm x 100mm (approx. 4 x 4 inch) hole pattern and must provide the proper weight capacity for the weight of the iMac, plus 2 lbs. For people who may not be familiar with the term "VESA compliant", VESA stands for "Video Electronics Standards Association". The common definition when referring to LCD and Flat Panel monitors is: "VESA standard" means a hole pattern on the back of the monitor; 75 mm x 75 mm or 100 mm x 100 mm (approximately 3" x 3" and 4" x 4" respectively). The diameter of the screws used to mount displays with VESA mounting is 4 mm. The VESA mounting holes on the back of LCD monitors may be centered or located towards the bottom stand. With certain displays you may have to remove the stand or a cover plate before you can access the mount holes. If you are interested in more in-depth information about VESA standards, the VESA.org website also provides summaries of the organization's display mounting standards. As confirmed by Apple's Support Site: No VESA Mount Adapter Kit for iMac Intel base 21.5 and 20 inch "aluminum" models. Also, previous "white" Intel base 20 inch and iMac G5 models with iSight, making these iMac models VESA non-compliant. 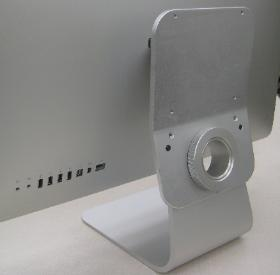 While similar in form to iMac G5 models, G5 models with iSight are not compatible with Apple's iMac G5 VESA Mount Adapter Kit (discontinued). The 20" iMac models from the "White" series iMac Core 2 Duo have the same housing and stand as the original Intel powered iMac Core Duo series, and these models are VESA non-compliant as well. The confusion is because Apple at one time did provide an optional VESA mount adapter kit with similar iMac models. The earlier iMac G5 models that could be made VESA compliant with adapter kits are: (2) models with 20" displays -- the iMac G5/1.8 20-Inch and G5/2.0 20"; also, (3) models with 17" displays -- the iMac G5/1.6 17", G5/1.8 17", and G5/2.0 17". With regards to all iMac all-in-one models offered after these pre-iSight models, only the 24" and 27" iMac models prior to late 2012 have had VESA adapter kits available from Apple. The 20" and 21.5" iMac models were left having no VESA bracket kit option and more importantly, no method for removing the stand. Because of this, and the fact that most people who purchase the 20" and 21.5" iMacs as a "portable" computer, it was essential to develop a VESA adapter kit for the iMac that would not require the stand to be removed or any modification to be made to the computer. Our iMac VESA Mount Adapter Kit provides the best of both worlds for the iMac user as it allows them the flexibility to attach their iMac to a VESA mounting system and mount their iMac the way they would like to e.g., above a work surface, on a wall, kitchen cabinet, etc. Then, when they decide to temporarily move their iMac to a different location or take it with them when they travel, the iMac is ready to go with a few turns of the patented fastening assembly. Note: *VESA wall mount or articulating arm device, or IMacs shown in pictures are not included. SKU: iVesa21 - VESA Mount Adapter Kit for all 21.5 4K Retina, 21.5 and 20 inch iMac models. 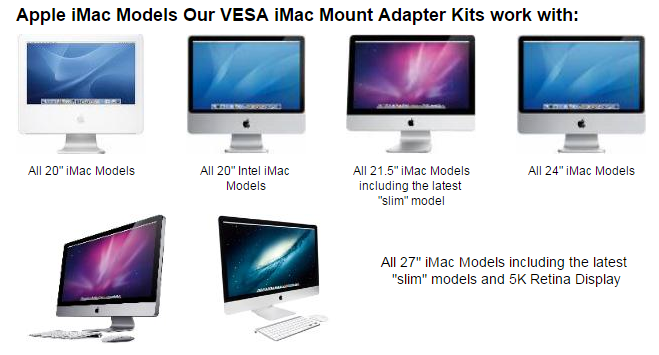 SKU: iVesa27 - VESA Mount Adapter Kit for all 27 5K Retina, 27 and 24 inch iMac models.